A grand convergence and unification of global studies about atomic and cosmic physics at the singularity origin and long course of the universe has occurred over the past decades. After an inflationary big bang, a sequence of quarks, muons, baryons and other particles synthesized into nuclear elements and chemical compounds. Slight gravitational ripples led forth to coalescing galaxies and prolific solar systems. Today, after centuries of observation and experiment from Galileo to satellite telescopes, a sensate Earth finds a celestial vista from infinitesimal bosons and maybe strings to infinite stochastic cosmoses. This fractal image is from the luminous Lunar Archives site: www.lunararchives.com and is titled Beginnings. Ambjorn, J., et al. The Universe from Scratch. Contemporary Physics. 47/2, 2006. By way of a method to observe and quantify a fluctuating quantum geometry at Planck scales (10-33 centimeters) called Causal Dynamical Triangulations. Anders, Janet and Karoline Wiesner. Increasing Complexity with Quantum Physics. Chaos. 21/037102, 2011. University College London and University of Bristol physicists continue the realization that their fields of study have much akin with the subject and theory of nonlinear systems. Statistical mechanics joined forces circe 2007, here it is extended within a seamless nature as it must into quantum phenomena. The Article Outline introduces, enters “laws of quantum physics,” then “quantum complexity” with an emphasis on computational correlations, phase transitions, and effects in biology and thermodynamics. Ashtekar, Abhay, et al. Quantum Nature of the Big Bang. Physics Review Letters. 96/141301, 2006. The cosmic singularity can be made more predictable by way of the theories of loop quantum gravity. A quantum bridge is then proposed to link two classical universes, one contracting, the other expanding. Bachlechner, Thomas, et al. Axion Landscape Cosmology. arXiv:1810.02822. We cite this entry by physicists TB, UC San Diego, Kate Eckerle and Oliver Janssen, University of Milan, and Matthew Kleban, NYU as their latest paper which by mathematical finesses that seem to allude to sentient beings able to learn this. I heard Kleban speak on The Axidental Universe at UM Amherst on November 9, second abstract below, and see also by this team Multiple-Axion Framework in Physical Review D (98/061301, 2018). Bohm, David. Wholeness and the Implicate Order. London: Routledge & Kegan Paul, 1980. The philosophical physicist draws upon unique insights into quantum theory to describe how an “explicate,” overt universe, its life forms and human dialogic consciousness, emanates from and reflects an “implicate,” unmanifest order. Bojowald, Martin. Quantum Cosmology: A Review. Reports on Progress in Physics. 78/023901, 2015. The Penn State physicist posts an extensive technical update on the two decade project to coherently join these disparate spatial and temporal domains. Bojowald, Martin. The Universe: A View from Classical and Quantum Gravity. Weinheim: Wiley-VCH, 2013. The Penn State physicist provides to date an expansive, topical survey from quantum cosmology, black holes, atomic particles, to relativity, waves, states, measurement, and stellar reaches from the big bang to unifications. 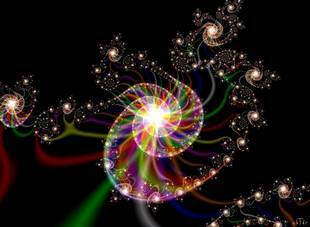 In regard, a number of cosmic “singularities” are recognized. Now could these novel human abilities to achieve such descriptions, as the apparent way a genesis universe tries to quantify and perceive itself, be realized as a further “singularity” of spectacular import and promise? Bousso, Raphael. The Holographic Principle. Reviews of Modern Physics. 74/825, 2002. A technical paper on a discrete, information rich universe akin to a hologram wherein the information content or measure of a three dimensional volume of space is proportional to the area of its two dimensional outer surface. One popular writeup of this approach is Hogan, Craig. “First Light.” New Scientist. January 11, 2003. A New Scientist update of Bousso's thinking is Touching the Multiverse by Amanda Gefter in the March 6, 2010 issue. Brumfield, Geoff. Cosmology Gets Real. Nature. 422/108, 2003. A news report on the growing affirmation by the worldwide astronomical community of the big bang evolutionary model of the universe. While biology has become systemic, and neuroscience integrative, physics remains preoccupied with arcane mathematics, noted in journals as cut off from actual nature. Philosophy, once in the lead for Planck, Mach, and Einstein, only provides commentary. In such a conceptual state of affairs, the rise of life, mind, and selves is irrelevant to a moribund, expiring universe. One wonders how a fertile organic reality could be perceived, indeed suffused with information but genetic in kind, whose propensity for self-organized complexity engenders not absurd bundles but phenomenal persons. Could our bicameral humankind be witnessing a natural genesis evident not from benthic theories of everything but of “everywhere” as its independent source becomes universally manifest, word to flesh to word? Castelvecchi, David. Shadow World. Science News. November 17, 2007. A report on the well-received ‘conjecture’ of Institute of Advanced Study physicist Juan Maldacena, that also offers a good review of quantum theory frontiers. Another entry is the article by Michael Dine on String Theory and the LHCollider in the December 2007 Physics Today. But are such gyrations akin to Ptolemaic epicycles which tried to prop up a fundamentally erroneous model?